I’ve been reading a lot about authenticity lately. I guess this is self-selecting, as it’s a topic that interests me and tends to permeate the spaces I spend time in (yoga studios, blogs that focus on health and self-care, therapy). But authenticity seems to be having something of a moment, too—or so book titles and articles would suggest. For the holidays, my mom gifted me with a copy of Baron Baptiste’s new book, Perfectly Imperfect. I was touched that she thought of it, knowing how important my yoga practice is to me. It’s concise and readable, and it contains lots of good insights into the true meaning of yoga practice. The chapter that stood out most to me is called “the myth of the real yogi.” In it, Baptiste addresses the false notion that a true yogi is always serene, peaceful, enlightened, and compassionate. It’s not that the qualities aren’t desirable, but rather that embodying them all the time doesn’t leave much room for our whole, complex humanness. “I see a real yogi as someone who is committed to growth and to being the best version of themselves . . . [s]omeone who is not afraid to get real about the whole mess of who they are—the good, the bad, and the ugly; someone who can be open and own that they get depressed, stressed out, pissed off . . . I’m not advocating that anyone be a specific way. It’s just important to acknowledge who we are in all our forms and personal expressions, even if sometimes those forms are not how we’d like ourselves to be. I read those words last weekend, and oddly enough, this last week presented me with lots of small opportunities to speak my truth—including moments when being honest might have hurt, frustrated, irritated, or disappointed other people. I tried to bring authentic words to these encounters, but I was reminded of how much work it can be to be truthful. When I say “truthful,” I don’t mean brutal honesty or being needlessly blunt. I mean what Baptiste is talking about—approaching interpersonal situations with sincerity and heart, speaking directly and honestly. It can be difficult to do this when you’re a people pleaser. I know it’s impossible to keep everyone happy all of the time, which is all the more reason to be forthwright. But it sure isn’t easy. I don’t have anything particularly original to say about this, except that it’s on my mind a lot lately, and I’m still figuring out how to show up truthfully while also being sensitive and compassionate. It’s good to keep reading, to continue gathering inspiration, and to practice, practice, and practice some more. If any books or creative works come to mind along these lines, I’d love some suggestions, or to hear what’s guided and inspired you in authentic, direct communication. 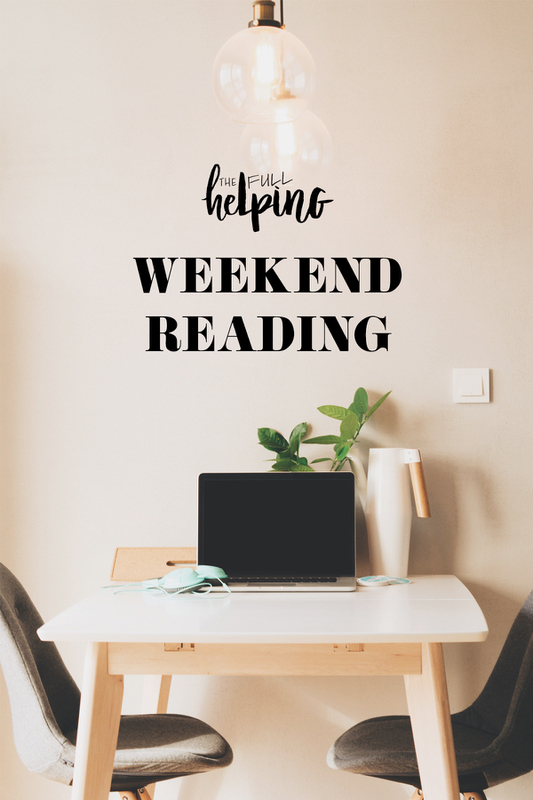 In the meantime, I hope you’ll enjoy the roundup of links and recipes this weekend. 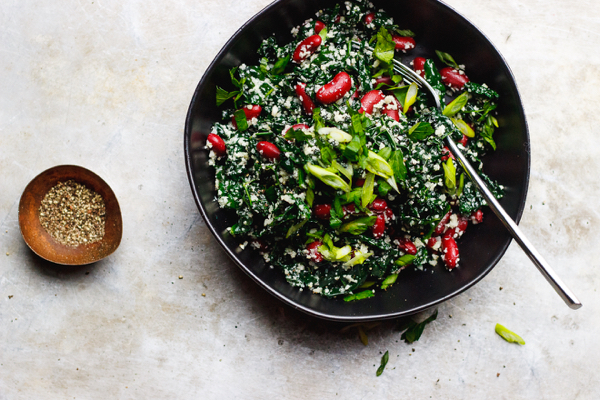 I love the vibrant colors of Sherrie’s garlicky kale bowls with red beans and cauliflower rice! (And also love how quickly the recipe comes together—15 minutes in a skillet). 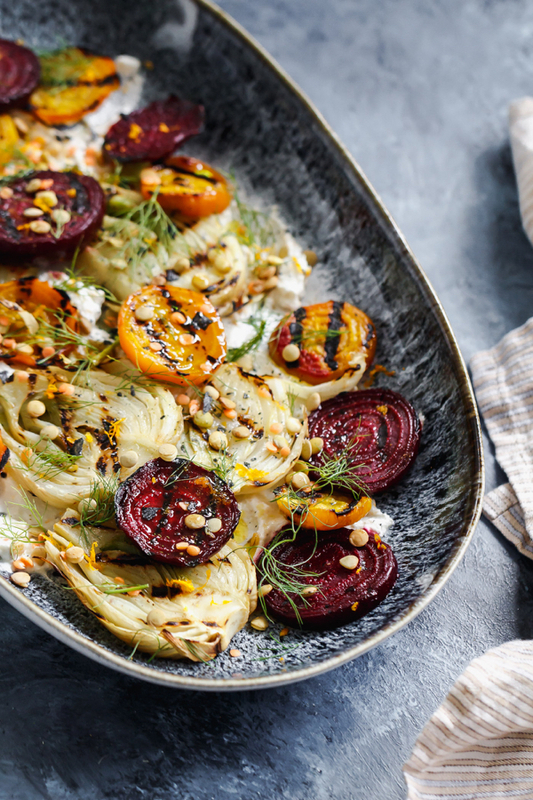 A gorgeous winter vegetable side dish: a grilled beet and fennel salad with vegan yogurt and sprouted lentils from Denisse of Le Petit Eats. 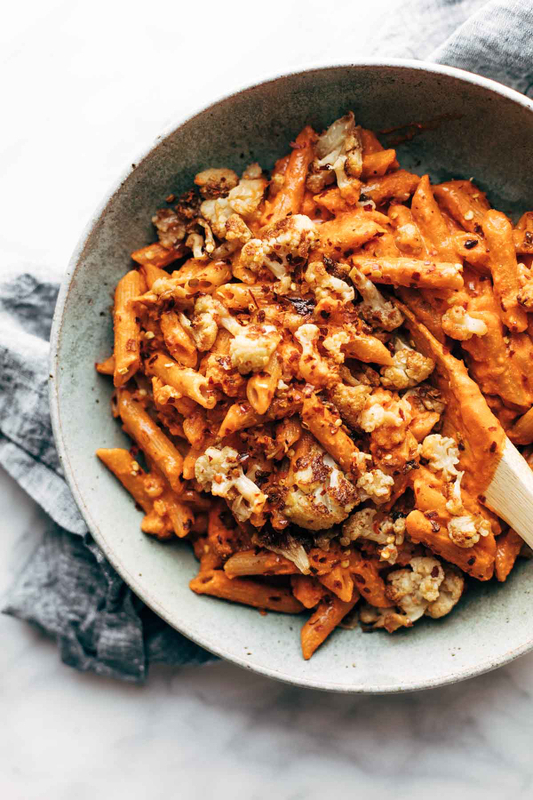 Lindsey’s creamy red pepper cashew pasta is not only a perfect comfort food dish, but also surprisingly easy to make. I love the short ingredient list, especially for a hearty and crowd-pleasing meal like this. More comfort food goodness! 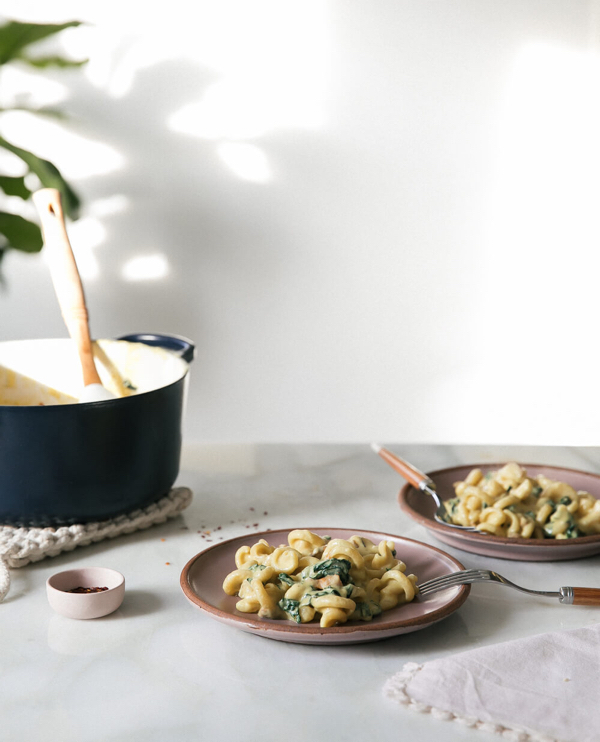 Adrianna’s creamy vegan kale and mushroom mac hits the spot for winter, and I also appreciated her candid words about visions and intentions for the new year. Finally, an appetizer that’s impressive and deeply flavorful, but streamlined to make: Erin’s quick & easy focaccia pizza. 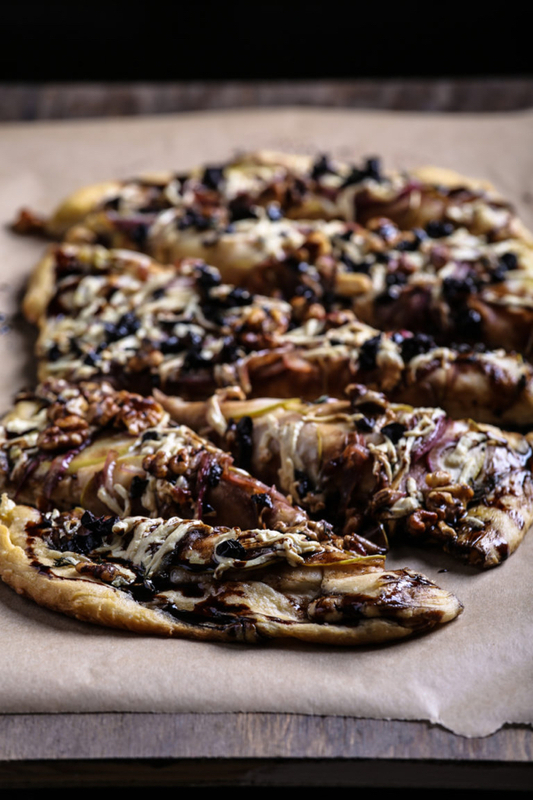 I’m digging the sweet balsamic glaze and the unexpected topping combo of red onion and apple. 2. 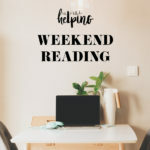 I’ve shared a lot of articles about weight stigma and its consequences within the healthcare industry, but I’m sharing another, because it’s so well-researched and thorough. Carrie Dennett covers the cost of weight stigma, from physician’s offices to social media to research. 3. I was inspired by this profile of NITEO, a pilot program at Boston University that’s dedicated to giving students the coping schools and bureaucratic support they need to navigate higher education while also managing severe anxiety, depression, and other mental health conditions. The times in my life when I became most susceptible to anorexia all involved substantive changes, either in the life cycle (early puberty) or in the course of my growth (going off to college, transitioning through my twenties). Even today, major life changes—especially those for which I don’t feel prepared—evoke that part of me that wonders whether tightening the grip on my diet would make me feel better. It’s so important for us to talk about this connection and to give women and men who have had EDs the tools they need to protect recovery longterm. 5. Finally, important reporting on how consolidation in the healthcare industry is injuring America’s rural and community hospitals. This week, a comforting, warming, and wintery lentil dish to serve over your favorite grain. Look forward to sharing, and wishing you all a great rest of the weekend. Have your read Nonviolent Communication by Marshall Rosenberg? It’s the best book on communication I’ve read. That’s awesome-I earmarked the same quote from “Perfectly Imperfect.” It’s not always so easy to be real, is it? Definitely something to practice every day! Authenticity has been a prominent theme lately for me, too. Sometimes I feel confused about whether I’m being authentic or just trying to validate what is comfortable for me. Marshall Rosenberg’s Non-Violent Communication methods have been extremely helpful in better understanding the many feelings I/we all experience and how each of those feelings stems from a met or unmet need. Applying the model (so far in the sloppiest manner possible) is even more educational I recommend his recordings on YouTube and his audiobook as well. I like hearing the teachings directly from him vs. Me reading his written word & filtering it through my conditioned mind. Gena. Ever since first finding you, your blog and your books I have been deeply touched by your writing. The written word and the spoken word are quite different I realize, however, in your writing you are authentic. And it inspires me. Some of the people you’ve sited as guides for you are people who have also been guides for me, so often I can directly relate. Since you asked, I will share. Most recently I have been watching and listening to the guidance of Mooji. (Mooji.org) He has pointed me and many, many others beyond what we as persons often focus on, to that which is most enduring. Maybe his pointing will touch you also. Maybe not. But you can be sure you are loved no matter what. Hi Gena, I am curently reading the book ” white hot truth” by Danielle Laporte and I think it adresses very well the subject of authenticity. So far a really good book. I encourage you to read it some day! And thank you for what you do on your blog. I find you are a great source of inspiration. Much much love!